WASHINGTON ― The U.S. Navy will grow by more than 40 ships over the next five years, the Navy’s Budget director said Monday. But while the fleet will grow rapidly in the near term, the gains will sputter out shortly thereafter. While the shipbuilding budget request saw a relatively modest increase in the service’s 2019 submission over the previous year, service-life extension programs, a bevy of new destroyers and littoral combat ships will push the Navy’s numbers higher rapidly to 326 ships in 2023. That’s a jump of 46 ships over just the next five years from today’s count of 280. But from there the pace of growth will slow significantly, adding the final 30 ships of the Navy’s goal over the next quarter century. The Navy will not reach the goal of 355 ships until the 2050s, said Rear Adm. Brian Luther, deputy assistant secretary of the Navy for budget. The Navy’s new 30-year shipbuilding plan gets to President Obama’s goal of 308 ships by 2020, a year faster than the previous administration’s goal of 2021, and then moves up to 326 ships by the end of the five year future-year defense planning projections, and building 10 more ships than Obama was planning for during the same timeframe. The service will also buoy their numbers through service-life extensions on six of the older cruisers, meaning that in total, the service will have modernized 17 of its 22 cruisers past their 35-year service life. The Navy is currently upgrading its newest 11 cruisers through a phased modernization plan. It is unclear which cruisers will be modernized, and how it will affect the planned retirement of those cruisers starting in 2020, though the shipbuilding plan doesn’t show any large surface combatants retiring until 2024. The Navy’s end strength will also increase over the next five years, adding nearly 17,000 sailors, an approached that Luthor said was disciplined to not add ships or equipment without the needed sailors to support them. “I think the number we identified matches the ownership costs that we identified,” Luther said in his rollout of the Navy’s FY19 budget. “So we grow in lead of some of the equipment because we have to train people ahead of when the ship arrives. It was a disciplined approach to ensure we didn’t procure a ship without people, we didn’t procure a ship without armament, we didn’t procure a ship without armament. So it’s a very balanced and disciplined approach. The Navy’s 326 ships in 2023 will mark a high point under the current plan, but a slew of ship retirements starting in 2024 will start to drag down the numbers again. Those losses are driven by the final Los Angeles-class attack boats leaving the fleet and a handful of large surface combatants – likely a combination of cruisers and oldest destroyers. That will drag the fleet numbers to between 313 and 315 for a handful of years before the fleet is projected to start growing again in the 2030s. 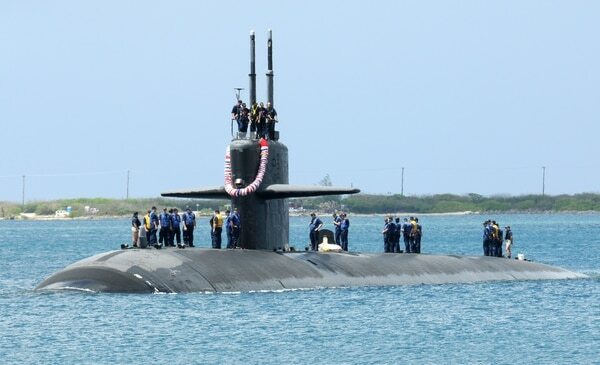 Perhaps most distressing of all is that even with the Navy’s current plan to continue buying two Virginia-class attack boats per year — even during years when they buy the Columbia-class ballistic missile subs — the fleet of attack boats will still see a precipitous decline in numbers to 42 boats, down from a projected 52 in 2019. The fleet’s requirement is 66 attack boats, a number the shipbuilding plan doesn’t hit until 2048. The Navy has identified anti-access area denial as a significant threat, Callender continued, and shorting the investment in attack boats, which can operate in areas that are denied by enemy missile batteries in the air and on the surface, doesn’t make a lot of sense. “It runs counter to where they say the threats are going to be – it’s a say-do mismatch,” he said. All told, the Navy’s 30-year shipbuilding plan won’t ever get that close to 355 ships. The highest the current plan gets is 342 in 2039. Some advocating for 355 ships were disappointed that the Navy doesn’t seem to be emphasizing the smaller ships to drive up numbers, opting instead to accept fewer, more capable ships. “Overall, although I’m glad to see the numbers come up, I think they are bypassing some opportunities,” said Jerry Hendrix, a retired Naval Flight Officer and analyst with the Center for a New American Security. Hendrix said he’d like to see the Navy explore some more creative options for maintaining force structure like procuring more frigates and fewer high-end destroyers to drive numbers, and identifying some of the Los Angeles-class attack boats to be refueled and extended in service to keep the attack boat numbers from dipping too low. “If you can re-core some of those boats – there may be between six and eight that we can extend – that will help us get through that bathtub,” Hendrix said.